It was certain that nothing quite like the Motorcycle Rodeo organised by the Camberley Club on August Bank Holiday, 1924, had ever before been witnessed in this country. It was an unqualified success. This charity gymkhana was held on a magnificent expanse of smooth turf in the beautiful grounds of the Royal Military College at Camberley in Surrey. Of course it made an ideal setting, and a military band gave the event quite an air of a society function. The initial game of motorcycle football, in which the acknowledged champions, the Middlesbrough Club, were matched against the home team, was a rather one-sided affair, as it was soon noticed that, although the Camberley riders were not deficient in dash, they lacked the well-practiced team work of the Northerners. But it was all good fun for the riders and spectators alike who were watching one of the leading motorcycle sports of the country. However, as time went on the Camberley boys began to shape-up very well, and it was obvious that two of their representatives - Gus Kuhn (Velocette) and W Julian (Levis) were as good as anyone on the field. The Middlesbrough side led by four goals to nil at half-time, while in the second-half Camberley scored one and their opponents three more, giving a final score of Middlesbrough 7, Camberley 1. Motorcycle Surf Riding was the next item in the intriguing programme. The Apparatus consisted of a wooden platform, having its trailing edge bound with metal, towed behind a very powerful sidecar outfit - a Harley-Davidson - which executed sharp and unexpected turns in the arena, the competitor holding firmly on to the reins the best way he could. This event caused great amusement, and Gus Kuhn and G Palmer were the only two competitors who managed - with feats of dexterity - to stay on the wildly-swaying board for the allotted time. The great thing to do, of course, was to place the weight so as to prevent the surf-board from overturning on a sharp turn, and so long as the course of the sidecar outfit could be prognosticated there was a sporting chance of keeping on. If not - a pair of legs waving in the air and a burst of hilarious laughter from the onlookers was the inevitable result! Gus had a very tortuous ride, but proved superior to the wiles of the driver and stuck on like a leech with the result that he won the Championship Cup. A sidecar polo match between the Camberley and Reading Clubs proved a less strenuous nature than the football event. The ball persisted in getting lost under the machines, sidecar tyres came off, mallets broke, and passengers fell out, but after a well-contested game, Camberley won 4-2. In the second football match (Reading v Basingstoke) Basingstoke on 4-0. The trick-riding on Solo and Sidecar machines produced some really amazing feats of skill, many of the competitors like Gus Kuhn having a very extensive catalogue of tricks. The solo feats consisted of riding across the machine and on one side; standing on the saddle and steering by means of reins attached to the handlebars; standing on the saddle (or carrier) and steering by balance; riding backwards, and riding with legs on handlebars, etc. The very versatile Gus Kuhn proved the winner of both the solo and sidecar trick riding events. He gave a very bustling display on his solo Velocette, comprising practically all the foregoing, and being called in before he had exhausted his "stock", continued his stunts in a corner of the field, where he admirably executed skid turns and figures of eight until his collapse from giddiness appeared inevitable and imminent! Gus also won the sidecar trick-riding competition on a Velocette combination, his stunts including riding with the sidecar wheel in the air. All the entrants did that, of course, only Gus varied the performance by doing this while sitting in the sidecar! One of his impressive tricks was to sit on the sidecar nose and execute a sharp right-hand turn which brought the back wheel up. The most spectacular event of all, perhaps, was the ski-jumping where competitors had to ride at speed up an inclined plank. Of the many terrifying leaps which were made, F J R Heath (Henderson) accomplished the best, and a record leap of an incredible 41½ feet! An amusing tilting-the-bucket competition won by Gus Kuhn in the solo category and B F Burney in the sidecar class, brought a most interesting afternoon's sport to a conclusion. And Gus - star performer of the day - had won no fewer than four events. He was pictured in the ensuing edition of "Motor Cycling" riding in the sidecar of his Velo outfit with the sidecar wheel two feet off the ground and steering with one hand! What a sportsman. 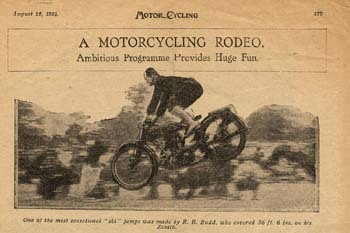 Three weeks before this Camberley Rodeo, there was the Motorcycling Club's Land's End to John O'Groats run, the second of the series which started on Tuesday evening July 8, from the Southern extremity of England. Speedway-rider-to-be, the enterprising Gus Kuhn brought out his 249cc Calthorpe once again to compete in this super-strenuous trial. Incidentally, a machine such as this - the 3-speed Calthorpe with a TS engine, cost just £42 brand new! And Calthorpe's 346cc model with a JAP engine cost £50, facts which are hardly believable today. There were certainly a glamour about a ride from one end of Great Britain to the other, and it was that which accounted for the entry of 49 motorcyclists, supported by 36 car drivers. The total of 1,700 miles was completed in two stages, each of 850 miles. In stage two, the route from Golspie to John O'Groats was fairly plain sailing, except for the climbing of Berriedale - a main road hill with two hairpin bends. It was reported that in his usual dashing style, Gus Kuhn made a fast climb. Apparently the other Calthorpe rider L Heller and Gus had kept together, as they were always accustomed to, for they had been photographed at Gretna Bridge, and the picture appeared in the motorcycling magazines the following week. The ambitious Camberley Club's American Hill-Climb in mid-October proved, by the number of interested spectators who attended, that there was certainly a big future for events of this type in England. The chosen slope was sufficiently severe to fail two thirds of the entry. Although it was a fearsome 1 in 3 gradient it was the high tractive resistance of a heather-grown surface rather than sheer gradient which caused the stoppages. Thus there was none of the spectacular toppling over backwards of men and machines which photographs of genuine American Hill-Climbs led one to expect. Nevertheless, it was a grand afternoon's motorcycling sport. Gus Kuhn ... always riding either the Calthorpe or the Velocette ... always thinking up something different, for on this particular occasion he was using a spud-shod, tireless rear wheel in his "Velo", but this proved too much strain on the rear chain, which broke time and again! Thus the event proved a little disappointing for Gus ... but a triumph for C Harman, the star performer, who used an obviously "hot-stuff" but suitably geared 349cc Zenith-Bradshaw, fitted with short lengths of chain spaced around its rear wheel! Incredibly he won all three events - the 350cc class, 600cc and Unlimited - a really superb performance. Incidentally, this particular Hill reminds me of the one which was the exit from the "Wells of Loneliness", part of the course included in the Wessex Scramble in Red Rone Hill, near Devizes, of 1929, 1930 and 1931, when as a schoolboy I used to watch with awe the riders at this particular spot. Such renowned exponents as Bert Perrigo (BSA), Graham Goodman (Norton), (1930 Trophy winners), Jack Williams (Rudge) the 1929 Trophy winner, and Wilmot Evans (Triumph) who were the real kings of the rough-stuff sport. Amazingly none wore crash-helmets, just caps or berets! Bert Perrigo and Wilmot Evans were Speedway riders as also was Ron Hieatt (Norton) who won the Senior event in the 1931 Wessex Scramble, and Ron was a notable member of the Wembley Lions in 1929. A report on the 1929 Wessex Scramble said: "... it is safe to say that not since the Camberley club affairs have so many hectic incidents been crammed into such a short space of time ... memories of Camberley were certainly revived." in 1928. And it is pouring with rain! His most successful competitive year so far and practically at an end, Gus won the Principal Award - The Thompson trophy - for the best performance in the South Midland Centre's Thompson Cup Trial held at the tail end of November over a very interesting course on Camberley Heath. He was riding his 249cc Velocette, and was the only finisher below 250cc. Gus also won the Captain's Trophy awarded for the best performance by a Camberley Club member. By now his ever-growing collection of Trophies and Medals was quite a large one - justifiably, a treasured one too. Boxing Day came round once more when the London-to-Exeter-to-London, the Classic Christmas Trial, would commence in the evening. Those that had regularly competed found the general atmosphere at the start at Staines very much as it had been, towards eight o'clock, in previous year and this was the tenth event. There were the same shining, black, wet roads, the acetylene flares from Allen-Liversedge, the same crowd of interested onlookers, marshals and police; the same legion of weirdly-garbed competitors streaming in and out of the hospitable portals of the Bridge House Hotel. And the staunch Gus Kuhn was there, still on his trusty "249" Velocette, still out to gain even more competitive honours. Heavy showers for an hour or two prior to the start boded ill for the hardy competitors, but, to their delight, the clouds, swept along by a strong southwester, vanished into the dim, dark distance, and, one by one, the stars came out and glittered sparkingly. What? A fine London-Exeter? What if the clerk of the Weather had become tired of giving his Christmas entertainment of rain or snow? Nevertheless, the elaborate gear of solo and sidecar drivers suggested that they were taking no chances. The long black Hutchinson ponchos and waders were greatly favoured as were sou-westers worn over flying helmets.